Each item has been chosen for its high reliability and remarkable value. The Evolis Primacy ID card printer provides unmatched print quality at an outstanding speed. 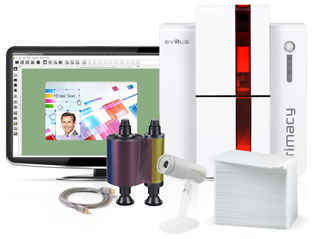 Durable, Primacy comes with a 3-year warranty on printer and printhead. CardPresso is the first ID card software designed for Mac OS X. Easy-to-use and packed with powerful features, this intuitive platform simplifies the creation of any type of badges. To capture stunning photo IDs, a camera with a five-layer glass, full HD 2.0 megapixel lens is included for perfect results. ID Security Online offers free shipping for all photo ID systems, along with full customer service and support. Single and dual-sided Mac-compatible ID card systems are now available at ID Security Online. ID Security Online is a leading provider of ID solutions and answers the needs of all organizations and corporations such as government, Fortune 500 companies, schools/universities, hospitals, and international / local sporting events. IDSecurityOnline.com offers an extensive line of card printers, ID systems, supplies and accessories. These systems resist tampering with advanced features like holographic images, ghosted images, biometric data, smart card technology and enterprise level data base management. For more information, please visit www.idsecurityonline.com.